When Peter Simon Pallas explored the southern part of the Russian Empire he was the first naturalist who learned of a cat called "manul" by Kyrgyz people. In his first description of Felis manul from the sunny cliffs of the Tartarian Steppe he specified its size as similar to a fox with a large head and robust limbs. 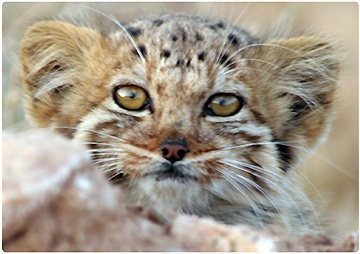 Its pale white-yellowish fur resembles that of a lynx but with a few dark hairs scattered over the body. Its head is spotted. A black line frames the eyes, and two parallel lines run sideways from the corners of the eyes across the cheeks. The short round ears are set wide apart and low on the head. The long cylindric tail has about nine narrow dark rings and a black tip (Pallas 1776; 1811). The Russian Zoological Museum received a specimen from the Altai Mountains, which had such long cheek hairs that they almost concealed the ears (Brandt 1841). The ears' inner borders and the top of the head are on the same level, giving Pallas' Cats a ferocious and restless look. The iris is yellowish, and in sunlight the pupils contract to small circular disks (Pocock 1907). Hodgson (1842) obtained three rufescent pale grey manul skins from Tibet, where they were highly prized and used for lining dresses. The soft and woolly fur of his skins averaged a length of 1.5 inch (3.8 cm) with some hairs up to 2.5 inch (6.3 cm). Satunin (1904) accounted of brownish grey Tibetan manul skins, and Birulya (1916) of Tibetan manuls with a silvery grey winter coat and white-tipped hairs. Pallas' Cats from the Transcaspian region, Iran (to the left), Afghanistan and northern Pakistan are rusty-reddish with silvery contour hairs and faint stripes (Ognev 1928; Pocock 1939). Adults vary in head-to-body size from 46–65 cm with a 20–31 cm long tail and weigh 2.5–4.5 kg. Skulls are 84.1–95.1 mm long, and carnassial teeth 10.4–12 mm. Females are smaller than males (Heptner and Sludskii 1972). Text by Angie Appel, January 2014. Photos by courtesy of Kevin Law (upper right) and Taher Ghadirian (lower left). Birulya, A. 1916. Materialy po sistematike i geograficheskomu rasprostraneniyu mlekopitayushchikh. VI. O rasakh Otocolobus manul (Pallas) i o polozhenii evo v sisteme sem. Felidae. [Systematics and geographic distribution of mammals. VI. Races of Otocolobus manul (Pallas) and its taxonomic position in the Felidae family]. Ezhegodnik Zoologicheskogo Muzeya Imperatorskoi Akademii Nauk XXI: 130–163. Brandt, J. F. 1841. 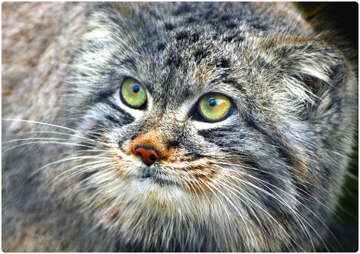 Observations sur le Manoul (Felis Manul Pallas). Bulletin scientifique publié par l'Académie impériale des sciences St. Petersbourg 9: 37–39. Heptner, V. G. and Sludskii, A. A. 1992. Manul Felis (Otocolobus) manul Pallas, 1776. In: Mammals of the Soviet Union. Vol. II, Part 2: Carnivora (Hyaenas and Cats). Smithsonian Institution Libraries and the National Science Foundation, Washington D.C. Pp. 665–696. Hodgson, B. H. 1842. Notice of the Mammals of Tibet, with Description and Plates of some new Species: Felis nigripectus Illustration Journal of the Asiatic Society of Bengal 11: 276–277; Plate: 333. Ognev, S. I. 1928. On a new form of the steppe cat from the Transcaspian region [Otocolobus manul ferrugineus]. Doklady Akademii Nauk Soyuza Sovetskikh Sotsialisticheskikh Respublik, seriya A: 308–310. Pallas, P. S. 1776. Felis manul In: Reise durch verschiedene Provinzen des russischen Reichs in einem ausführlichen Auszuge, Volume 3. J. G. Fleischer, Frankfurt und Leipzig. P. 490. Pallas, P. S. 1811. Felis manul In: Zoographia rosso-asiatica. Editio 1831, Volumen primum: 20–23. Pocock, R. I. 1907. Exhibition of a photograph and the skull of a specimen of the Manul or Pallas' Cat (Felis manul). Proceedings of the Zoological Society of London, 1907: 299–306. Pocock, R. I. 1939. Genus Otocolobus Brandt. In: The Fauna of British India, including Ceylon and Burma. Mammalia. – Volume 1. Taylor and Francis, Ltd., London. Pp 315–321. Satunin, K. 1904. Trichaelurus, eine neue Feliden-Gattung, und die Arten derselben. Ezhegodnik Zoologicheskogo Muzeya Imperatorskoi Akademii Nauk IX: 495–506.